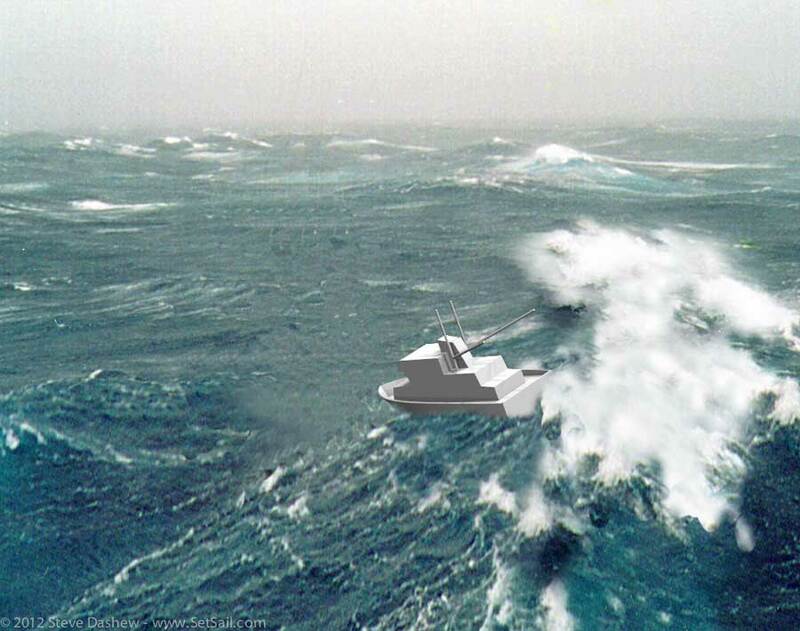 When we wrote our book on survival storm tactics, Surviving the Storm, in 1999, we had no practical experience with powerboats. As a result, we relied upon interviews with a variety of professional seamen. We now have a bit of real world experience, and lots more anecdotal information on heavy weather powerboat tactics. As the FPB 64 Owner’s Manual is about to have its storm tactic chapter written, we thought this a good time to update our general powerboat tactics information as well. We would normally wait until both were complete before excerpting these on SetSail, however, the video below has some important lessons we want to make it available now. More will follow in the coming months. Over the years, we have made a habit of studying all manner of heavy weather incidents. Situations like the 1979 Fastnet, the Queen’s Birthday Storm, and 1998 Sydney Hobart race are full of lessons for designers, builders, and sailors alike. But the material we have to use, interviews, synoptic data, photos of waves on occasion, are limited in what they can convey about the sea. Through the heroic artistic efforts of the late Steve Davis, we had a start at graphically describing survival storm tactics, but nothing we had before compares to the video that follows. 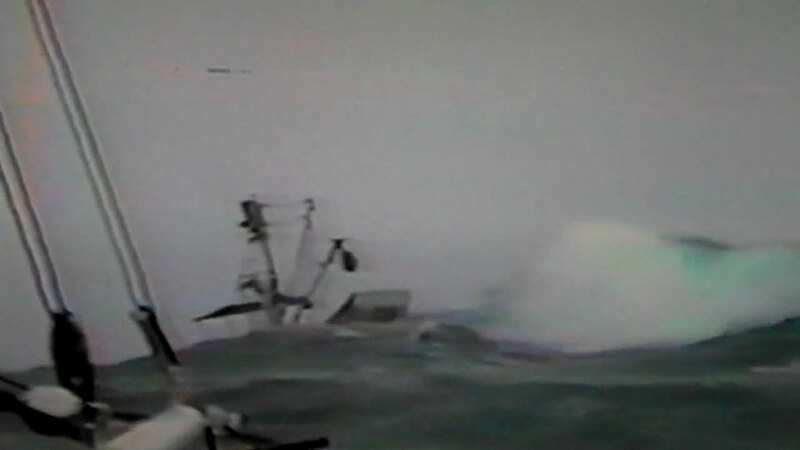 The unique camera position is ideal for giving a sense of the sea state, and how the trawler being filmed is reacting to it. We have watched this four minutes of material dozens of times now, and still learn something new with each viewing. We thought you might find it of interest as well. The video will initially run its full length, then you will find some slow motion clips of a few noteworthy situations. And finally freeze frames–stills–of certain areas of interest. We’ll make some additional comments with a couple of diagrams at the bottom of the post. But first, a few words on the subject of advice related to heavy weather. There is no magic formula, no one approach that suits every situation. 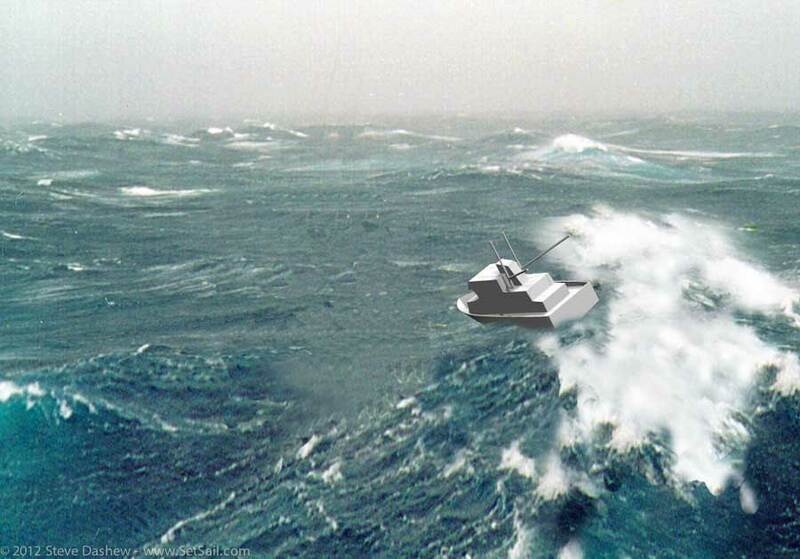 Every mix of vessel, crew, waves, weather, and navigational hazards is different, and constantly changing. As such neither our comments here, our articles, nor even Surviving the Storm can do more than help you to try and understand your situation when the chips are down, and perhaps see an approach that reduces the risks. It bears repeating that there is no formula, no magic bullet, that works every time. Okay, let’s head to the Gulf of Alaska. The audio is not the best, but you can clearly hear one of the crew saying the weather was getting better. You may have noticed the sea state does not reflect this. It is often the case that the wind will drop rapidly with the passage of the storm center. When this occurs, the waves, now without wind pressure, are typically at their most dangerous. If you are sailing, when the wind drops, it is usually necessary to increase sail are and maintain boat speed for steering control. But this is usually the last thing anyone wants to do. Under power, know that rather than relaxing with the easing of wind pressure, this is when you must be at your most vigilant. The sense of the sea state chaos is better in this video than anything we have seen before. If you watch this frame by frame on your computer, or look carefully at some of our freeze frames, you will find significantly larger waves than the norm, on the order of twice or three times larger. Check out the building crest in the background upper right in the photo above. And here on the left and right sides. This is probably not an anomaly, and we expect that if you had the camera height to survey your surroundings in storm force or stronger conditions they’d look a lot like this. We have seen the same sort of isolated wave peaks in other footage we’ve studied over the years. We know that in our own limited heavy weather experience we’d rarely notice many really big, out of the ordinary waves. But when we’d later study the photos or video, we’d see them all over. We are not trying to scare anyone, but this video represents the real world in these weather conditions, and we think it not a bad idea to acknowledge this sobering fact of life and prepare for it. However, it is not as if you are totally at the sea’s mercy should you encounter one of these big ones. If you stay alert you will often see these waves far enough in advance to move the boat away from the worst of the wave, or align to take the sea at the boat’s safest angle. 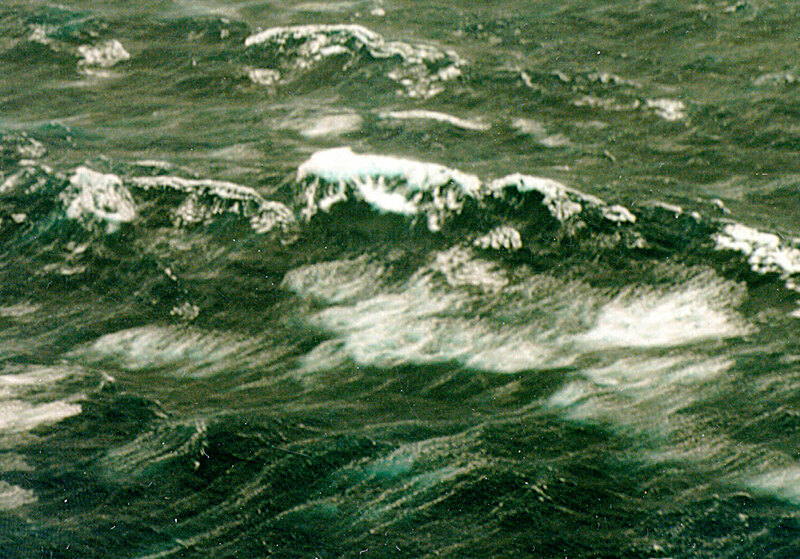 Take a look at this remarkable wave photo taken during the 1998 Sydney Hobart Race. From what the photographer told us, and what we can see for ourselves, the trough to crest dimension is well in excess of 65 feet/20 meters, and probably close to 80 feet/24 meters. If you are under that crest, the odds of staying upright are minimal. But look at its shape. There’s a survival zone to the left and right. What worked well in some of the racing yachts that survived this storm was to have one person watching and calling waves for the helmsman, who is concentrating on driving. We feel the same would work well with a motor yacht. A large bow floodlight will help to map a course in some nighttime situations. But often you can see what you need without a light, even on a moonless night. The convergence of two wave trains, taking what appears to be direct aim at the trawler, is not uncommon post-frontal passage phenomenon. The frotnal boundary marks a wind shift of about 90 degrees, and a new set of waves with which to contend. Sometimes they cancel each other out, sometimes they reinforce each other. What are the consequences of losing steering control? Will you broach presenting your vulnerable beam to the oncoming crest? How much stability is there for absorbing side wave impact, and can you recover from a capsize? Sail boats do better here as they have positive stability typically to 120 degrees or more, and much more steering authority than most powerboats. If you heave-to or jog into the seas, what is the likely result weather-wise? Will the system pass you by, or does stopping expose you to a more violent sector of the system? Keep in mind that often a change in position of 20 or 30 miles will make a huge difference in sea state. Are there navigational risks associated with running? What about ocean and tidal currents and their impact on the seas, and how do these vary geographically? There may be a scenario where jogging into the seas keeps you in an area where the current is tidal and when it switches direction all hell will break loose. Running with the waves means fewer wave encounters, and they will have reduced impact when they hit. There are many approaches to running in big seas. The angle and speed that is safest varies with the vessel design, as well as conditions. 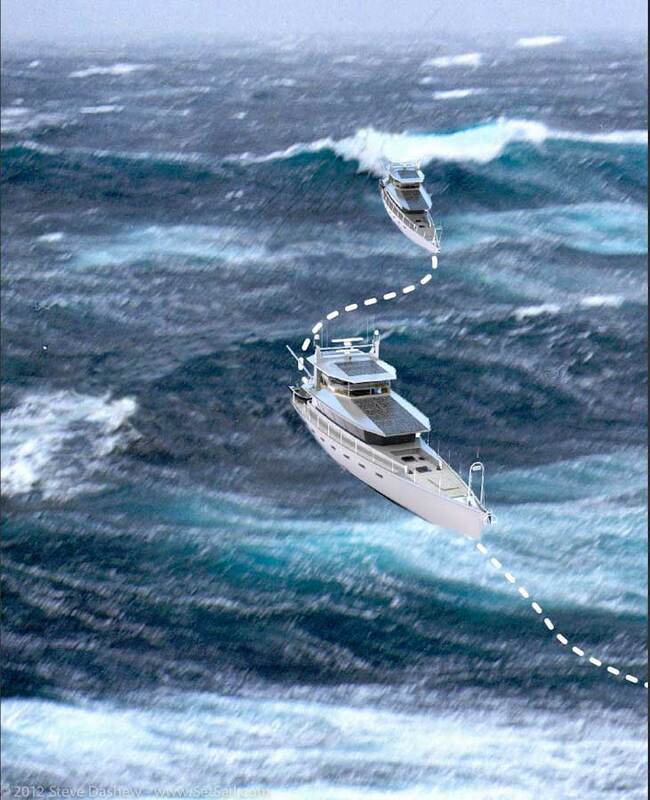 In order to get a feel for what works best, we’d urge all mariners to go out in moderate heavy weather and experiment with angles, speeds, and vessel reactions. Far better to learn this under controlled conditions, than when your survival may depend on the correct approach. We’ve taken a couple of the photos from Surviving the Storm and used them to illustrate what we think has happened with this trawler capsize. To begin with, check the shape of the wave face. Unless you have very good steering control, and a long, buoyant bow, you will not do well going straight down this wave. To do so may risk a broach or pitchpole. Without the ability to head down the wave, taking the seas at a slight angle may be the only option (other than turning around and heading into them). The ever present risk is “bow steering” where the immersed forward sections of hull dig into the wave and become a point about which the boat pivots. The deeper the bow, the greater the risk. Vessels with bulbs forward are particularly prone to bow steering. 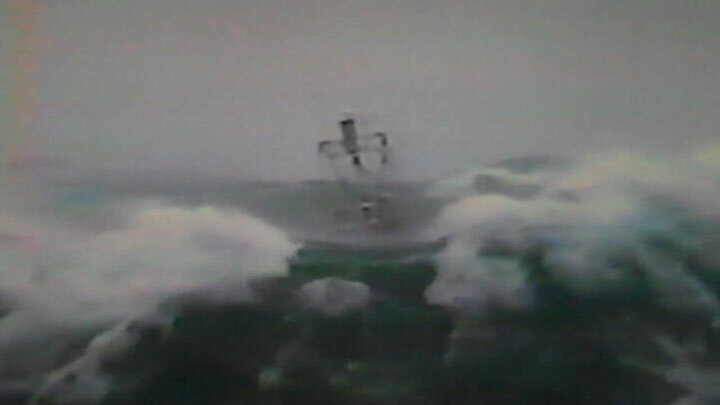 The position of the trawler on the wave shown above, the turning force of the boat pivoting on its bow, and the initial impact of the wave, all create heeling forces. As we saw in the video, at about a 45 degree heel angle the trawler is very sluggish in returning to upright. Most of her stability is gone, and it won’t take much of an impact on the windward side to finish the job. Vessels are far more stable along their length than sideways, often by a factor of five to ten. This brings up a Hobson’s choice. Keeping the wave on the stern gives you more stability with which to cope with wave impact. 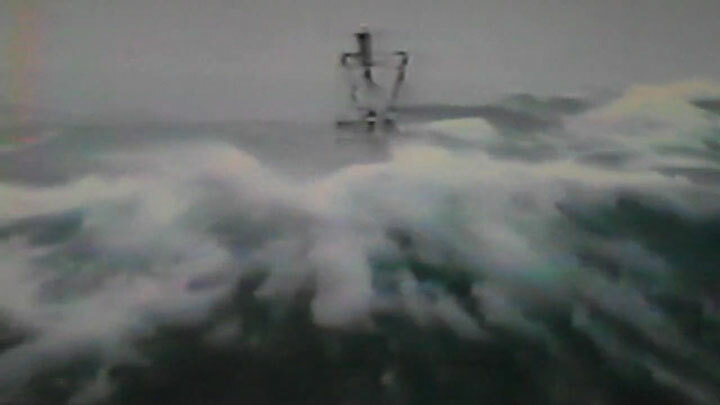 But if steering control is lost heading down the wave face, you are risking broaching as with the trawler in the video. At this point serious consideration needs to be given to heaving-to. The tactics appropriate for a conventional trawler would not necessarily hold true for one of our FPBs. Once again the main question is steering control. When you run out of this precious ingredient, then heaving-to, jogging in place, applies with the FPB as well. At some point, running with the seas will no longer be tenable, at which point you turn into the waves. Wind Horse, and the FPB 97 shown above, will be able to surf off ahead of and down the seas through wilder conditions than would be appropriate with the FPB 64. This is the result of a lighter (for its length) hull and less forefoot immersion. In the graphic above, the boat in the background is just beginning to take off down the wave face. As long as speed is maintained, and you have good control, you reduce wave impact and frequency, and have the ability to look for the least adverse segments of the wave trains to traverse. You can run pretty much straight down the wave initially, and then, depending on shape, speed, and the vessel loading, pull up before running on the back of the next wave. Our experience with Wind Horse to date is that we have never come close to feeling uncomfortable surfing down the wave faces. Couple this with the FPB’s ability to slip sideways with wave impact and absorb the energy thereby imparted over time, and a very high heeled stability, and we feel safe in saying that in the past 200,000+ miles of cruising, we have not seen a situation which would warrant heaving-to with our FPB 83. 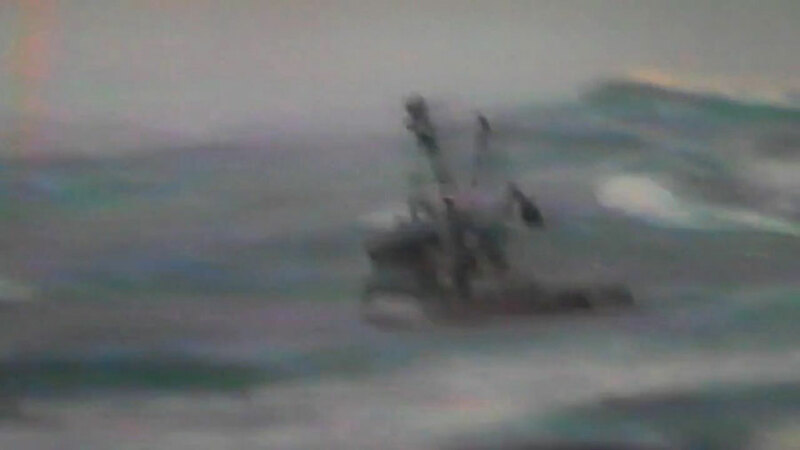 That said, if we were in the same seas as the trawler in this video, the storm center had passed, and waiting four to six hours would result in much smaller seas, we’d seriously consider turning around and heading into the waves. A topic that needs addressing, but for which time does not allow, is the towing of drogue/warps off the stern to help stabilize steering. The FPBs come equipped with Gale Rider drogues, rodes for attaching them, and massive tangs on the belting (rub strake) for connection. Much more detailed information will be found in our Surviving the Storm and in a post we did some years ago testing various drogues. 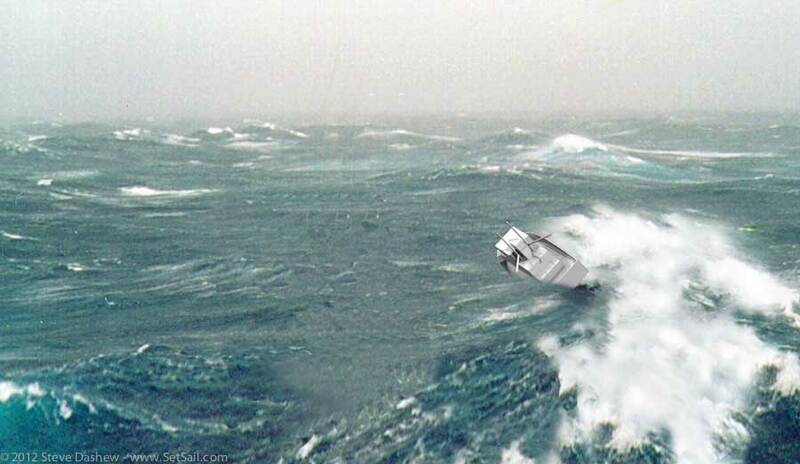 Regardless of vessel type, sea state, and weather prognosis, it behooves the cautious mariner to stay alert to changes in sea state and the vessel’s reaction thereto. And when conditions change, change tactics with them. For another post on heavy weather tactics click here. A video examining Surviving the Storm is here. And there are two gale force videos shot aboard Wind Horse. The first, between New Zealand and Fiji, is here. Another, in the North Atlantic, between Greenland and Ireland, is here. 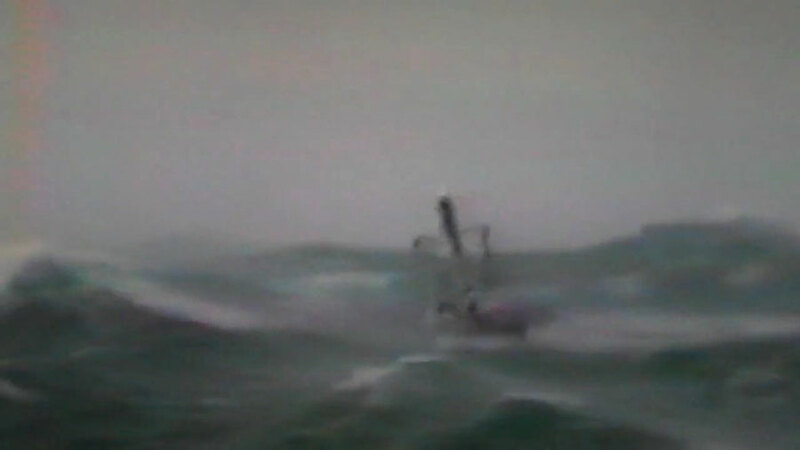 Finally, there is an interesting FPB 64 video, surfing in gale conditions, here. Enough on this topic for one post. Time for a little relaxation. However, before you go, a request. If you know of other good sources of heavy weather video, we’d love to hear about them. Also, comments on any real world experience with heavy weather that you would like to share are welcome. This entry was posted on Monday, June 4th, 2012 at 12:25 am and is filed under Dashew Logs. Both comments and pings are currently closed. In addition to being interesting and entertaining your website provides valuable insight and potentially lifesaving information to all who care to view and consider the real world lessons you try to covey. I look forward to reading your site daily. Thanks. Steve, here are a couple of youtube videos with impress wave footage. As I am currently finishing reading “surviving the storm” I find your report compliments your book. By the way “surviving the storm” is by far the best book I read on the subject. Extremely well reseraced, containing a wealth of information, and most importantly explaining the mechanism as well as the different weather parameters behind the philosophy of the varying techniques. Truly a classic. Although I have it for a few years now (along with the cruisers encyclopaedia) it really started to make sense after I build on my sailing experience doing sail and power deliveries and encountered a few gales and the occasional squall. Took your advice and experimented with different techniques in moderate conditions. By the way any chance of an updated version of the cruising encyclopaedia….? As to an updated version of Offshore Cruising Encyclopedia, we are too busy at present, and it wold take several years of work. I made a collection of big wave videos some time back. The one you have shown was first on my list. Do you know what happened to trawler’s crew? Rescued by the fishing vessel doing the videography. Here’s some interesting footage I just came across of an undercanvassed, traditional yacht in short, steep seas. I thought you might like to review this recent post from a near capsize of a Nordhavn. I assume you have heard of these folks; they are very experienced. Read the post – thanks. Doubt the angle as the Maretron wind units are not well damped in terms of acceleration and heel/pitch from our experience.